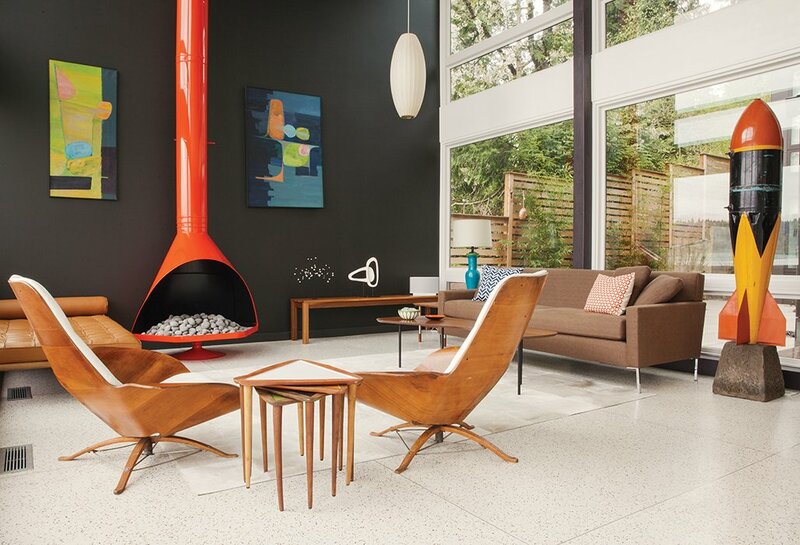 In the living room of a remodel in Seattle, the fireplace was powder-coated orange to complement the vintage furnishings. The sofa is from Design Within Reach; the coffee table is by Alexander Girard for Knoll. A pair of undated paintings by Arthur L. Kaye hang on a wall painted in a Benjamin Moore hue custom matched to the outside of the window frames. The triangular nesting tables are a vintage find. “They’re always billed as ‘guitar pick tables,’” resident Sally Julien says.